Most of us developed an interest in the Luftwaffe, its aircraft, its history and its personalities either through aircraft modelling or books. As a librarything.com member I thought it would be a good idea to look at some of the landmark books in our field and meet the authors. Bear in mind, when reading what follows, that it is very very hard to write a book. Writers and researchers producing Luftwaffe books are usually embarking on a very expensive 'labour of love' that brings little reward and which in some instances can completely take over their lives. As such they deserve great respect and our support in all their ventures. 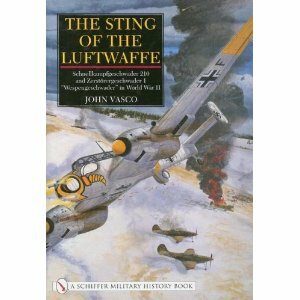 John Vasco probably needs little introduction to Luftwaffe enthusiasts. 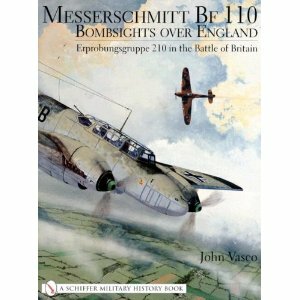 His history of Erprobungsgruppe 210 entitled 'Bombsights over England' broke new ground for Battle of Britain research when it first appeared as a slim 104-page self-published book in 1990. 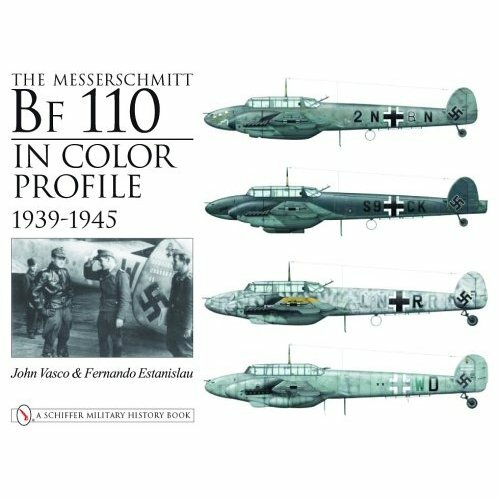 A further work on Bf 110 units in 1940 with Peter Cornwell via John's own JAC Publications and a second updated and enlarged edition of the original 'Bombsights over England' published by Schiffer in 2002 cemented John's reputation as the leading authority on the Messerschmitt Bf 110. Further works on the type have followed through Schiffer and Classic Publications and most Luftwaffe enthusiasts will have some or all of these titles on their shelves! 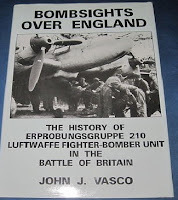 I was fortunate enough to meet John a few years ago at one of his Erprobungsgruppe lectures delivered at the Battle of Britain museum in Hawkinge, Kent and recently managed to persuade him to talk about his work and interest in the Bf 110 and specifically 'Bombsights over England' for readers of this blog. 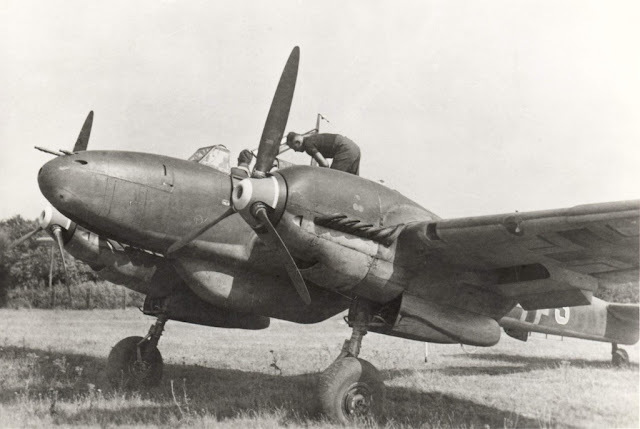 An all-round top man and excellent interviewee for what is hopefully the first in a new series on this blog as I look at the stories behind 'classic' Luftwaffe books and their authors.
" ..John, could you please tell us a little about yourself as a person, writer and historian ? " I'm 62, married with two grown-up children and two grandchildren. I was a Civil Servant for over 30 years before taking early retirement in 2001. I enjoy playing the guitar. 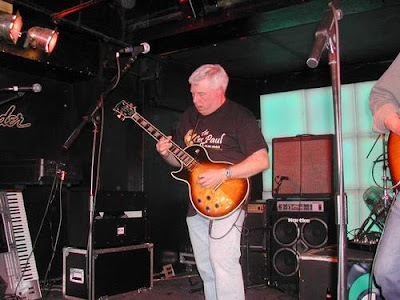 I started gigging in Liverpool in 1969 when I was still at school. I'm still gigging now. I've also written several books on the Messerschmitt 110. I started that research in 1980 and through the years I 've been to Germany on many occasions to do research, meet the veterans who flew the Messerschmitt 110 and set down their tales, copy their photos, etc.. I've been fortunate that I've got things into print, for example the two softback books in the 'Classic Colours' series - 96 pages each, 200 photos, covering the Bf 110 throughout its existence with the main emphasis being on the different theatres of war (ie Polish campaign, Western campaign, Battle of Britain, Russian campaign, Mediterranean campaign and Defence of the Reich) and the units which flew the type in those campaigns. I don't take myself too seriously and take each day as it comes following a heart attack in August 2001 and a triple bypass in 2002. That kind of thing makes you re-focus yourself on what are the important things in life (like family) and what are not (doing gardening etc). I suppose my writing goes back to the days when I worked in a Social Security office. For about 4-5 years I worked on the legal side of things, dealing directly with Acts of Parliament and their wording, and attending Tribunals representing the Department. That work certainly helped in developing a logical approach to everything, and also to setting things down correctly in writing. In hindsight, that was an excellent schooling for what was to come with my research. "..What prompted you to launch JAC Publications ?.." Quite simply, my Erprobungsgruppe 210 research being rejected by a couple of publishers. I knew it was worthy of publication, and so I set about making arrangements with my bank to set up JAC Publications and publish 'Bombsights Over England'. A couple of things as an aside: First of all, I wanted the the title originally to be 'Target England' but there was already a book out with that title; and secondly, 'JAC' comes from the initials of my wife Anne, and my children James and Claire. JAC !
" ..How did your interest in the Erprobungsgruppe develop ? What was your aim in writing the history of this unit ? " I've been asked this many times, not least by a few German veterans! So here goes. It starts, as I'm sure so many other researchers did, with plastic model aircraft. When my son was about 2 years old, I started making model aircraft (again) to hang from his bedroom ceiling. This would be late-'79/early '80. I was interested in the Battle of Britain period, and so Spitfires and Hurricanes, and 109s and 110s were soon flying in his room! At the same time I got books from the library and read up a lot more on the Battle of Britain. This one particular unit kept cropping up in the books: Erprobungsgruppe 210. They used the Messerschmit 109 and 110 fighters as fighter-bombers to go in low to attack targets, first of all shipping around the south-eastern coast of England, and later land targets. So I then set about starting research into them (that was 1980) and ten years later I published my history of that unit. That's how it all started. What struck me was that two or more books would cover the same event and yet have completely different factual conclusions about the event. Now this is where my arrogance came into play. I thought 'I can do better than that! ', very arrogantly. When casting around for a subject, I was intrigued by this unit that flew fighters as bombers during the Battle. I thought that given their specialist nature, someone must have covered their activities and produced a book, but after checking around for some time, it became clear that that was not the case. So I set about trying to find out more about Erprobungsgruppe 210. The first person I contacted was Ken Merrick, who was absolutely superb in his response to me, and has been so over many years. The breakthrough came with two other people: Peter Cornwell and Karl-Fritz Schröder. When I contacted Peter he was very supportive and gave all the assistance he could, and provided pointers and further contacts also. As for Karl, he was the only person to reply when I had a letter of request printed in 'Jägerblatt' in 1983. He advised me of the 'Wespentreffen', which included former members of Erprobungsgruppe 210, and invited me to the 1984 meeting. I attended, met some former members, received a lot more information and further contacts, and things developed from there. As for the aim in writing the history of the unit, what gradually dawned on me were two things: firstly, there was quite a bit in print about the unit which was simply wrong; and secondly there was quite a bit about the unit which was not known, and which I had uncovered.It developed to the point where I believed I could write a book about all that I had gathered. "..How much time was devoted to the research and writing of this particular book ? And your other books ? How was/is the work-load shared with co-authors and/or associate researchers..? " I was working a full 5 day week, so throughout the 1980s all the research was done in the evenings when the two children had gone to bed, and at weekends. It took up a LOT of time in the pre-internet days! I mentioned earlier that I had made contact with Peter Cornwell. During a visit to his house, I mentioned that I was thinking of doing all the 110 units in 1940 after the Erprobungsgruppe 210 work was finished. He suggested that we do the 110 work together, and so that alliance was formed. It was to result in several journeys to Germany for a week at a time, some of the incidents of which are now the stuff of legend between myself and Peter! 'Stück Puck' indeed! (Zerstörer, page 252). 'Sting of the Luftwaffe' came about through my attendance at the Wespentreffen several times, and the gathering of many photos of that unit. Also through contact with former members and relatives of those who had been killed in action who were able to provide information and photographs. I offered it to Schiffer and they accepted. The books I did with Fernando Estanislau were interesting. 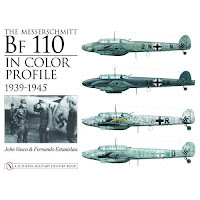 Schiffer approached me, having published a 2nd edition of 'Bombsights' and also 'Sting of the Luftwaffe', and asked me to do a work on profiles on the Messerschmitt 110, similar to the single-engined books that they had done. I agreed to do so, but only with an artist who could do justice to the subject, and with whom I was happy. 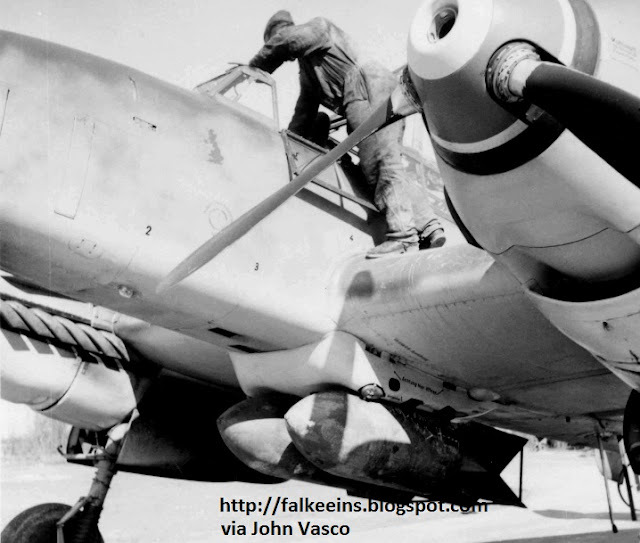 Fortunately, enter Sergio Luis dos Santos from Brazil, who had contacted me a few times regarding Bf 110s. He e-mailed me this particular time and asked me to check over a line drawing a friend of his had done. It was of a ZG 1 'Wespe' Bf 110. I opened the attachment and immediately said to myself: 'This is the artist I've been waiting for!'. So I made contact with Fernando, explained the project, and he was happy to do it as a joint venture. So for about the next 3 years we spent hundreds of hours at our computers, talking via e-mail and 'Messenger', thrashing out the content of the work that would become the 'Profiles' book for Schiffer. Because of the time difference between the UK and Brazil, I was up until 2:30 in the morning discussing things with Fernando. Fortunately by this time I had taken early retirement from work, so it didn't affect me much! We sought to cover everything from the 'B' to the 'G-4', and also set ourselves the strict guideline that if a side-on view was not available, no profile would be done. Chevron approached me to do a two-volume series for them, so I agreed so long as Fernando did the line drawings. So the two volume softback work came out, but came in for some criticism because the title was misleading. They called it 'Zerstörer volume 1 & 2'. I told them to call it 'Messerschmitt 110' but my view was ignored. Then they got a heap of criticism (as I did) because the title was misleading, as it did not include the Me 210 & 410, nor the Ju 88. Valid enough, but the Publisher did not take on board my point. Chevron then came back and asked for an in-depth book on the 110, as they had begun to develop that theme with other Luftwaffe types. 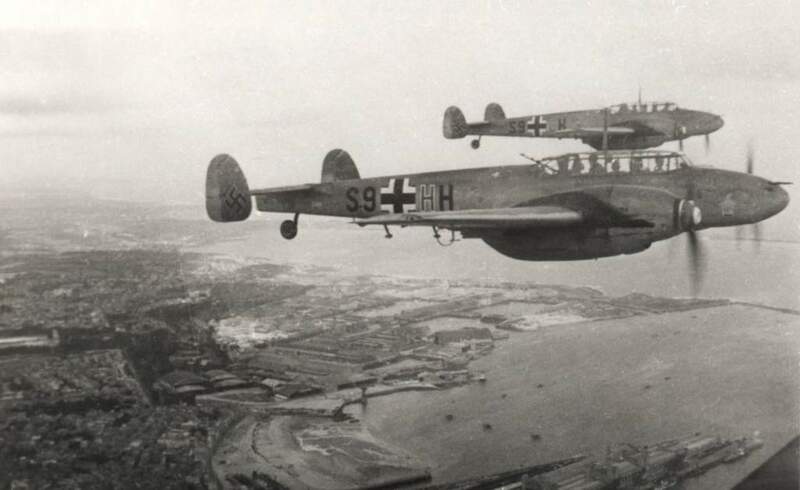 I agreed on the basis that it would be a joint work by myself and Fernando, and it would only cover the Bf 110 C, D & E. So we moved forward on that and eventually that came to fruition. I have to say that Fernando's approach to the research and the work was first class. On the whole, very well. 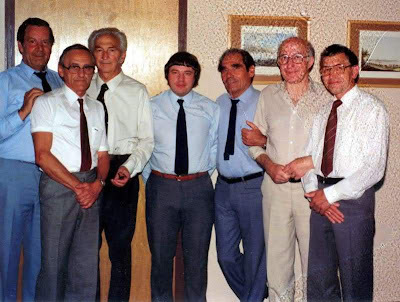 Karl Schröder once told me that one of the Wespen veterans (a former ground mechanic) questioned what I was doing at their reunion, in the company of others, and they all immediately rounded on him. This was after I had published 'Bombsights', and the book was known by all at the Wespentreffen, so by then I was accepted by them. I made contact with one former member of Erprobungsgruppe 210, who I knew would have good information to give to me, but all I received was a nice reply, rounded off with 'Was war ist gewesen' - What's gone is gone. When I met a member of his Staffel some time later, I asked him why I would receive such a reply. He told me that when the new Staffelkapitän of 2./210 arrived at the end of June 1940, he made this pilot's life hell. So that period in his life, the exact period I was interested in, was something he was not prepared to revisit. When that happens, you have to respect their wishes.But I must restate that I was made most welcome by those I came into contact with. One pilot of 210 was very reserved until Karl Schröder spoke to him. In the end, when passing out complimentary copies of 'Bombsights' in 1990, he invited me to his house to stay overnight, which I accepted. His wife provided me with a superb meal, and Helmut Ortner and I then watched one of the World Cup games in his front room. Excellent hosts, and a top man! When 'Bombsights' came out, and I had copies with me at the Wespentreffen in 1990, there was a great interest from most who were there. I took as many as I could in my large suitcase, and sent another ten on to Karl Schröder in advance by air mail for him to bring to the reunion with him on my behalf. After giving out the complementary copies to those who had assisted with the work, the others were snapped up immediately, and still more paid me for a copy to be sent on to them. The feeling that I got was that they felt that their small story was being told for the first time. I think a quote from the Preface of 'Sting of the Luftwaffe' sums up things best of all: As young men they flew and fought because of the call to arms of their native country. In the post-war years it is hard to understand the perceived guilt carried by some of them once the full horrors of the Third Reich regime for which they fought were laid bare before them. This was brought home to me in a totally unexpected way on the last morning of one of the Wespentreffen which I attended. From amid the hubbub of 'Wespen' guests departing from the reception area of the Hotel Selau in Neunkirchen-am-Brand one member approached me. I had not met him before, and we had not had occasion to talk during the Treffen, but he had obviously found out who I was, and why I was there. He offered me his hand, and in faltering English said 'Mr. Vasco, perhaps now I know we are friends again'. He then took his leave of me, picked up his luggage and headed into the car park. For one man, my attendance may have changed, to some small degree, the perceptions which he must have carried for many years, of how people of other nations, and different generations, saw him and his generation.." It was one of the very rare occasions in my life when I was totally speechless! When 'Zerstörer' came out in 1995, Peter Cornwell and myself received many kind letters from former 110 crews thanking us for telling their story. Also, for many of them, they found out for the first time what had happened to others in Bf 110 units that they had known. All in all, the responses from former members was a somewhat humbling experience. Is there any one piece of information or fact that you uncovered that you are especially proud of..? Can you tell us about your proudest and most frustrating moment as a writer..
1. Seeing a proper photo of the 30 mm cannon for the first time in the album of ground mechanic Willi Falkenroth; 2. Identifying the correct unit (Erprobungsgruppe 210, not Ju88s) that raided Biggin Hill on 30th August '40. 3. Correcting the incorrect information about who was Staka of 3./210. Previous publications had said it was Hptm Valesi, whereas it was Oblt. Hintze. I was able to establish that Valesi was on secondment to the unit because of his knowledge of using a fighter as a fighter-bomber, no doubt gained from Rechlin. ">Most frustrating moment: this is ongoing - not yet finding a single confirmed photo of Rubensdörffer's S9+AB!!! "And what do you say to people like me who ask you or have asked you to comment on the various colours used on wartime Luftwaffe aircraft, including Rubensdörffer's S9+AB .."
What we know is generally based on information from a variety of sources. That would include German documentation that survived the war, RAF AI(1)G intelligence reports on crashed aircraft, and AI(1)K intelligence reports on interrogation of prisoners. So, going on to specifics, the use of the colour blue for the third character of the fuselage code on Bf 110s of 1./Erpr. Gr. 210 came from AI(1)G reports and discussions/interviews with personnel of 1. Staffel, viz, Wolfgang Schenck (pilot); Werner Neumann (pilot); Karl Stoff (Bordfunker); Edmund Ernst (Bordfunker); Otto von Steinhart (pilot) and ground mechanics Willi Falkenroth and Werner Wulf. Pitfalls? I should point out though that the groundcrew I interviewed freely admitted that when they had to paint aircraft and get them combat ready, if insufficient stocks of a particular camo colour were not available, they would mix in the nearest colour to get the job done. 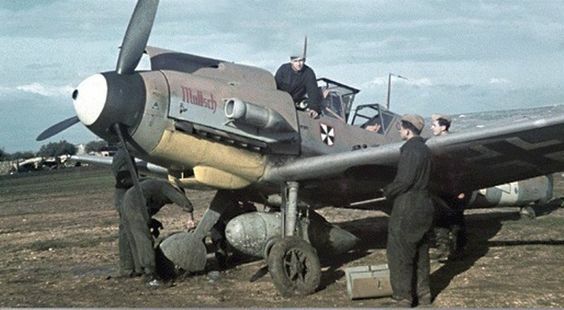 So while we wring our hands over such-and-such a colour on a WW2 Luftwaffe combat aircraft, those guys way back then didn't give a toss as to being 100% correct, only in getting the work done in whatever way possible, as quickly as possible, to satisfy their senior officer.
" ..What was the GdJ Treffen in Berlin like in 1991..? "That was the first Treffen to be held in Berlin. There was a very moving ceremony at the grave of Werner Mölders and it was incredible to see the awe in which the attendees held Adolf Galland. Hearing the assembly at the Treffen do the 'Hussassa' chant was memorable..
2. Get to know your market, in other words, explore all the outlets that could possibly take your book. 4. Be realistic in your pricing, and be flexible to a great extent in the terms you offer the outlets. Too stringent terms, and you will not move your stock. 5. Don't underestimate the costs in stationary and publicity, and also the cost of mailing books out to suppliers. 6. Be prepared to take some non-payers through the small claims court to get your money. The only project I am working on now is the 'Eagles Over Europe' project headed by Larry Hickey. Not surprisingly, my remit is the Bf 110. 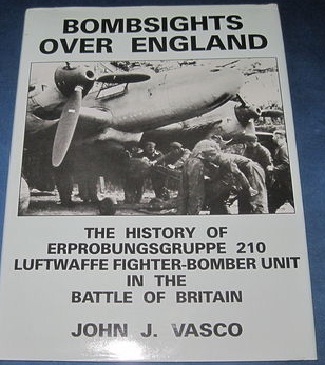 When it finally reaches completion it will be the most comprehensive in-depth study of the first 15 months of the air war in Europe from September '39 to December '40..
"...John, thank you for answering my questions, thank you for your superb books and good luck with EoE!.." Below; group photo of Erprobungsgruppe 210 former members and author John Vasco at Neunkirchen-am-Brand. From left: Karl-Fritz Schröder (3. Staffel); Karl Stoff (1. Staffel) (Pow 17/11/40); Wolfgang Schenck; author John Vasco; Balthasar Aretz (2. Staffel); Gerhard Schlee (2. Staffel); and Edmund Ernst (1. Staffel) (PoW 6/9/40).Third from left Wolfgang Schenck finished the war with the Luftwaffe equivalent rank of Colonel and was the last Luftwaffe 'Inspector of Jet Fighters' in WW II.